Around the world, digital archivists look for strategies to preserve these pieces of our shared history. Much of the work involved is technical- trying to find ways to keep original media intact and accessible or copying it into a digital format. However, translators and transcriptionists also have a crucial role to play in preserving these materials. Transcription is one way to preserve the content of an audiovisual resource. Digital transcriptions also have the advantage of being easily searchable. However, transcriptions are no substitute for the original content. Nor is transcription a replacement for proper storage and digitisation. The magic of actually hearing voices and seeing images from the past is irreplaceable. That said, transcription is still an essential part of the preservation process. For example, the US nonprofit organisation LYRASIS recommends that all recordings be transcribed and indexed, with multiple copies of the transcription saved in different formats. [T]his wealth of knowledge is not equally available to all. To the extent that much of it is written in English, non-English-speaking professionals are at a disadvantage. Whether your business goals include entering new markets overseas or reaching more people in your own backyard, it’s essential to choose the right language services provider. Like any good partnership, your relationship with your LSP will only get better with time . . . as long as you’ve chosen the right provider. Choose poorly, however, and your relationship will soon disintegrate under the pressure of issues with translation quality, deadlines, and project management. Much better, then, to choose wisely the first time. 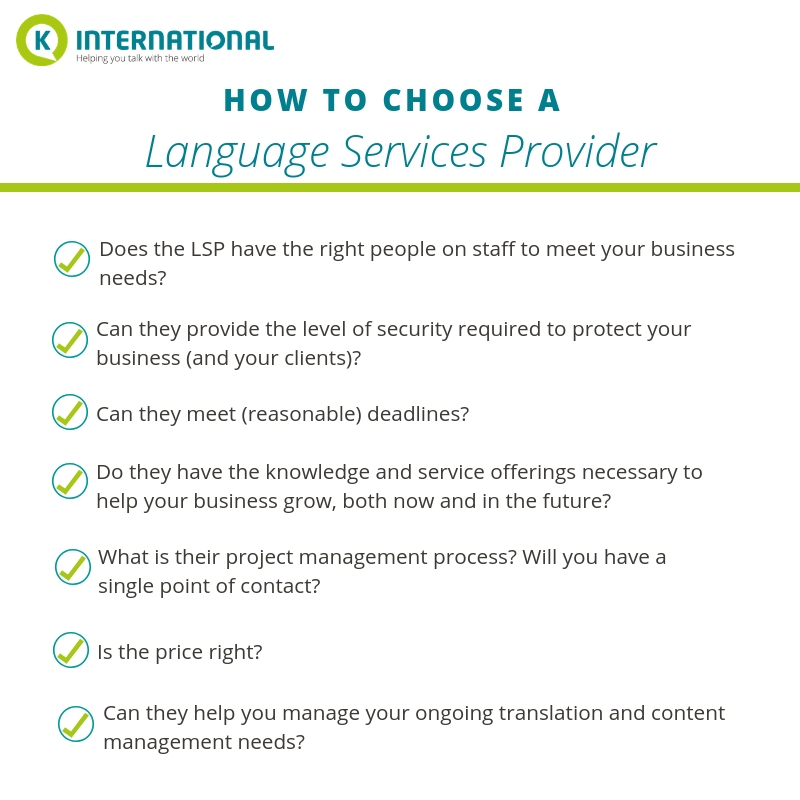 If you’re not sure how to choose a language services provider, our helpful checklist will walk you through the key factors involved. ✅Does the LSP have the right people on staff to meet your business needs? The strength of a business lies in its people, and LSPs are no exception. Before you select a language services provider, make sure they have the staff to handle your business needs.